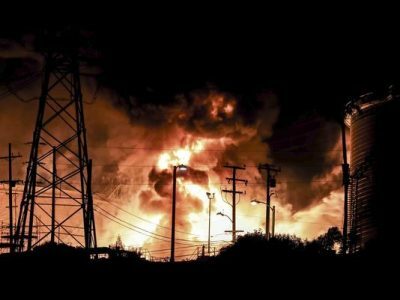 A fire that erupted at the West Coast’s largest oil refinery threatened storage tanks and sent huge flames into the sky and black smoke across neighborhoods before crews quickly smothered it. Dozens of firefighters responded late Tuesday to the 1,000-acre Chevron El Segundo Refinery just south of Los Angeles, which processes nearly 275,000 gallons of crude per day. Residents were urged to close windows and shelter in place as dramatic flames roiled at the facility and thick plumes of acrid smoke traveled through neighborhoods. Surrounding streets were briefly closed, but no evacuations were ordered. No injuries were reported. Crews using firefighting foam kept the blaze from spreading to storage tanks and within about a half-hour, there was little visible flame. Chevron officials did not immediately comment Wednesday on the possible cause. Fires at such refineries have had implications for gas prices, though it wasn’t yet clear if this one would. The refinery, the West Coast’s largest, supplies 40 percent of the jet fuel to nearby Los Angeles International Airport and has 20 percent of the gasoline market share in Southern California, according the company’s website. About 1,100 Chevron employees and 300 contract employees work there. The El Segundo refinery dates to 1911. Its name is Spanish for “the second,” and was bestowed because it was the second refinery built by Chevron predecessor Standard Oil Co. The first refinery was built at Richmond in 1901.